This meeting is all about expanding your knowledge of paper and starting a notebook of Paper Samples where you can keep track of papers you use, their attributes (such as colors, dimensions and weight), and where to purchase them. 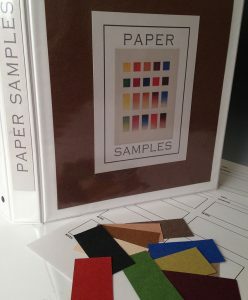 You will begin several pages of your sampler at the meeting as we talk about how to select papers for specific book-making purposes. We’ll also have examples of books that illustrate how the papers have been successfully used. This knowledge will inform and inspire book projects to come! We will provide pages designed for labeling paper samples, several sets of samples, plastic sleeves to hold them, and a “PAPER SAMPLES” title plate. You can put them into a binder later, or better yet, bring one with you. A 3-ring white, 1” binder is perfect to begin your library of paper samples.